You are allowed to make the conversion from print file to image formats in your OS X system if you choose PCL to PNG Converter for OS X as your tool. 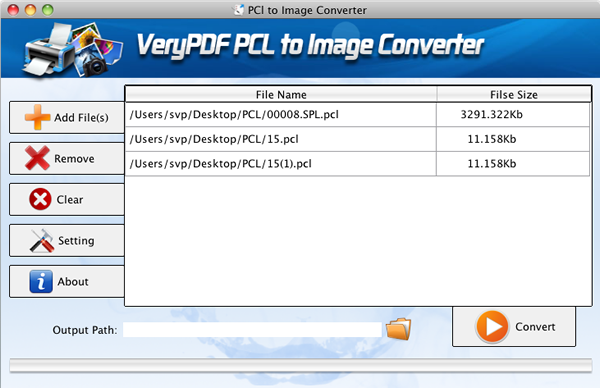 PCL to PNG Converter for OS X is an excellent application which can convert the document such as PCL, PRN, SPL, etc. to image like PNG, BMP, JPG, etc. and able to set different parameters for target file such as resizing page size, customizing image resolution, setting color depth, etc. So this page will show you how to use this app. At first, you need to download the application via clicking here. Then please double click the installer of the application and follow the installation instructions to set up the file on your Macintosh. When the installation is over, you can double click the app icon to open it. Then a user-friendly interface will pop up to your sight, in which you can do all the operations for converting PCL to PNG. 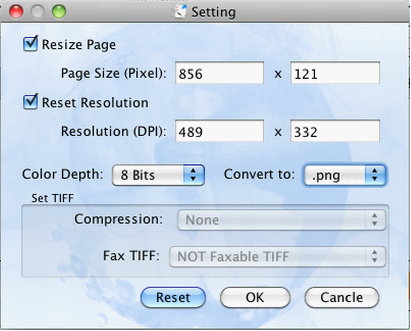 Please see the interface of PCL to PNG Converter for OS X in Figure 1. There is a file list in the middle of the interface. For adding PCL document into it, please click Add File (s) button to open file picker window in which you are able to choose the document that you want to convert and click Open button to add it. Then you can delete the added file one by one by clicking Remove button or clear the file list by clicking Clear button. Now you can click Setting button to open Setting dialog box to set parameters for target file. Please see Setting dialog box in Figure 2. If you need to set page size for target file, please check the option Resize Page to activate Page Size edit box and then you can input page width and height into the two boxes. If you want to set image resolution, please check the option Reset Resolution to activate the edit box Resolution and then you can input horizontal and vertical resolution in the two edit boxes. If you need to set image color depth, you can choose the option as 1 Bit, 8 Bits or 24 Bits in Color Depth spin box. In Convert to spin box, please choose the output format as .png. At last, please click OK button to save all the parameters and close this dialog box. When it returns to the interface of PCL to PNG Converter for OS X again, please input the output path in Output Path text box or click the button besides to open the dialog box in which you are able to choose the output location for target file. At last, please click Convert button to make your conversion.